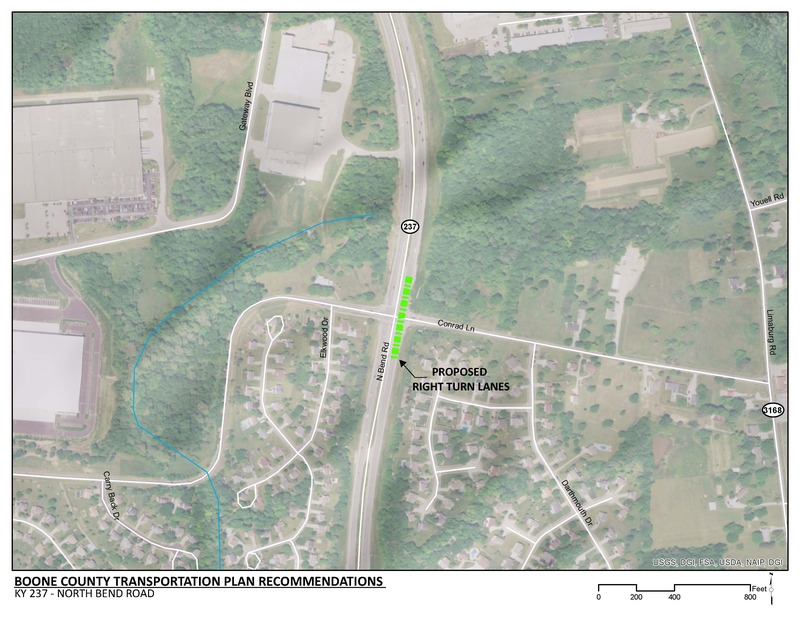 Install full right turn lanes on the KY 237 (North Bend Road) northbound and southbound approaches to Conrad Lane to improve capacity and safety. Sufficient storage will be provided for northbound and southbound right-turning vehicles from KY 237 to Conrad Lane. Replacing right turn tapers with full right turn lanes will reduce the likelihood of rear end crashes. KY 237 is located on a fill section with steep slopes on either side. Grading will be required to construct full right turn lanes. KY 237 serves as a primary north-south route through central Boone County. Conrad Road primarily serves residential land use and connects to KY 338 (Idlewild Road) and downtown Burlington. In peak hours, long cues of traffic turning right to Conrad Lane blocks KY 237 through traffic. The crash rate along this portion of roadway is over three times the statewide average for similar roadways. There are existing geometric deficiencies along the route, such as sharp curves, narrow lanes, and narrow shoulders. The existing cross section is not consistent with the use of the roadway.